I have three older brothers. Strong, compassionate, funny and kind, they are one of my greatest blessings. Though close in age to one another, there is a significant age gap between myself and them. Growing up, I cherished their time and affection. I loved the way they played with me, and found peace in how fiercely they loved me. They were my boys, my protectors and best friends. They aren’t perfect, but witnessing their struggles and challenges has been a great grace, helping me to grow in my own faith and relationships. My brothers have taught me so much about being a sister. It was from them that I learned how to stand up for myself and for the things I believe in, to be honest and fearless, to not take myself too seriously. They lead by example, both in the way they treated others and in the way they treated me. By being men of God, they taught me to be a sister in Christ. 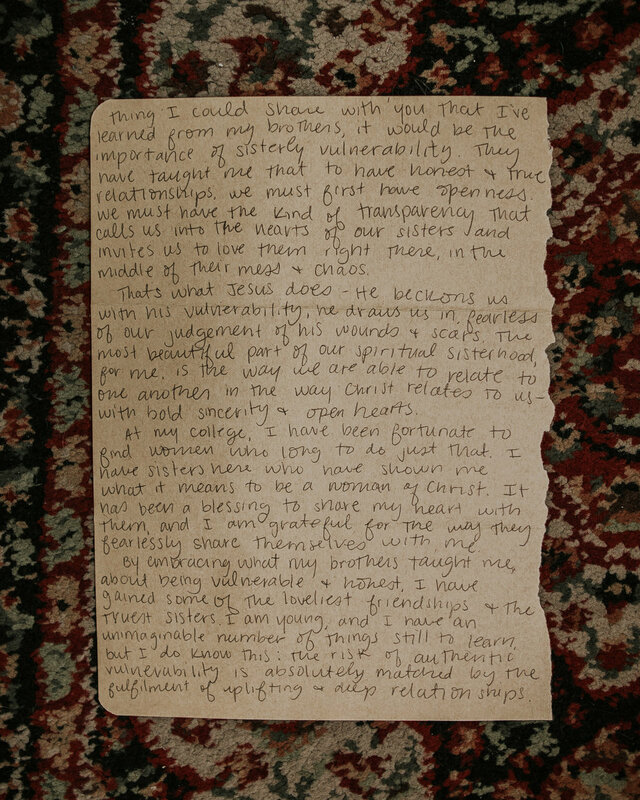 As a young woman trying to navigate the realm of Christly sisterhood myself, I know that it can be scary. Like, really scary. It is often a great challenge to be vulnerable, especially with those whose opinions we care deeply about, or with those we don’t want to disappoint. But if there is one thing I could share with you that I’ve learned from my brothers, it would be the importance of sisterly vulnerability. They have taught me that to have honest and true relationships, we must first have openness. We must have the kind of transparency that calls us into the hearts of our sisters and invites us to love them right there in the middle of their mess and chaos. That’s what Jesus does – He beckons us with his vulnerability, he draws us in, fearless of our judgment of his wounds and scars. The most beautiful part of our spiritual sisterhood, for me, is the way we are able to relate to one another in the way Christ relates to us – with bold sincerity and open hearts. At my college, I have been fortunate to find women who long to do just that. I have sisters here who have shown me what it means to be a woman of Christ. It has been a blessing to share my heart with them, and I am grateful for the way they fearlessly share themselves with me. By embracing what my brothers taught me, about being vulnerable and honest, I have gained some of the loveliest friendships and the truest sisters. I am young, and I have an unimaginable number of things still to learn, but I do know this: the risk of authentic vulnerability is absolutely matched by the fulfillment of uplifting and deep relationships. I encourage you then, my sisters, to be not afraid. Find rest in the realization that we are all a little bit messy, and that our mess is just what Christ longs for. By embracing the outstretched hand of a sister when we are in need, we embrace the outstretched hands of Christ on the cross – the most vulnerable act of all. He has given us the gift of sisterhood as an image of his relationship with the Church, and I am beyond blessed to be a part of a community of women who cherish this gift so deeply. Know you are in my prayers, whoever and wherever you are. My name is Sarah Malone, and I am a student at Saint Vincent College in Latrobe, PA. Currently, I am pursuing a double major in Engineering Science and Math, with minors in Theology and Operational Excellence, because I have an incredibly hard time choosing between things that I love – and so I’m doing them all! It's busy and messy and stressful I love every second of it.